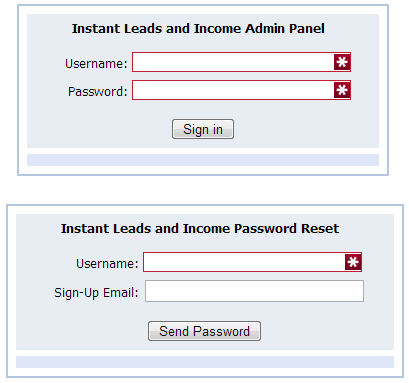 Marvin, This is where you will need to login and update or make changes to your Instant Leads and Income System. Here you can make changes to the email address you use to register in the system, Your First and Last Name, Your Usernames & IDs and also Your PayPal email address. If you need to make changes just follow the sample image guide below to insure you update the correct information in the system so that your links work correctly without errors. To login to your "Profile Update"
You will need your username: freedom4u2� and password you selected when you first registered in the system. Keep in mind that your username and password login details are case sensitive. We DO NOT know your password, it is private to ONLY you. If you DO NOT remember your password you can have it reset by using the reset tool on the login page.